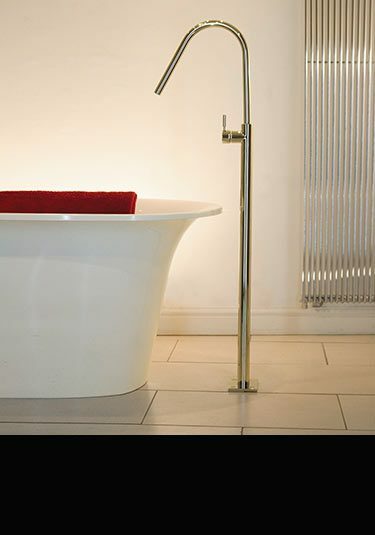 Freestanding bath taps make a beautiful design statement within high quality bathroom design. Traditionally available in Victorian designs in chrome, gold and nickel plated finishes, now floor standing bath taps are being made in highly contemporary styles to suit modern minimalist bathroom styling which is now very popular. Livinghouse offer a selection of freestanding taps for both baths and basins, they are the very best in European quality and in the latest Italian and European styling. We can offer floor mounted designs with the classic hot and cold taps as well as the more contemporary single lever mixers for the easy mixing of the water. We also have designs with or without shower attachments, but a handheld shower head is highly recommended as it is ideal for hair washing and bath maintenance. For those who would like a specialist tap finish we offer gold, nickel, stainless steel and copper finishes for more exclusive bathroom design themes. Very high quality, this luxury floor standing bath filler is a contemporary addition to exclusive bathroom design. 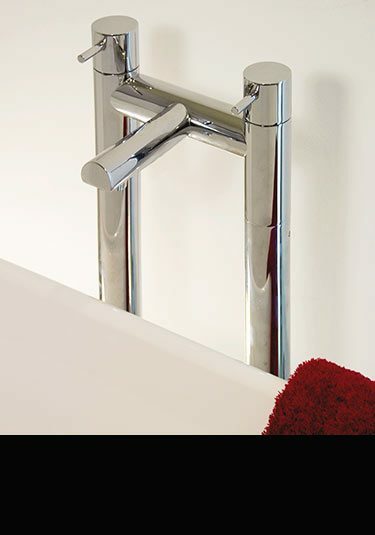 This chrome freestanding bath tap includes a handy shower attachment which is ideal for relaxed hair washing and easy bath cleaning maintenance. Italian designed and manufactured. Impressive floor standing basin taps with a single lever water mixing. 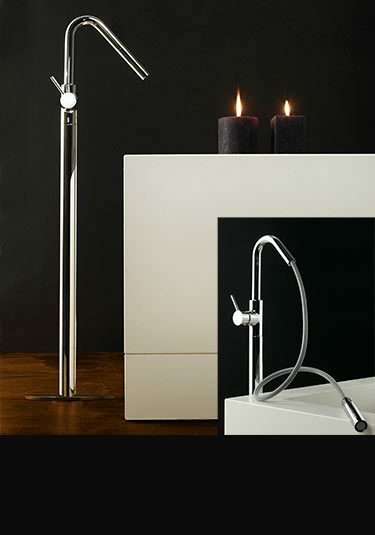 This freestanding tap is luxury styling and is a beautiful design feature to any quality bathroom. This basin filler is Italian designed and manufactured. 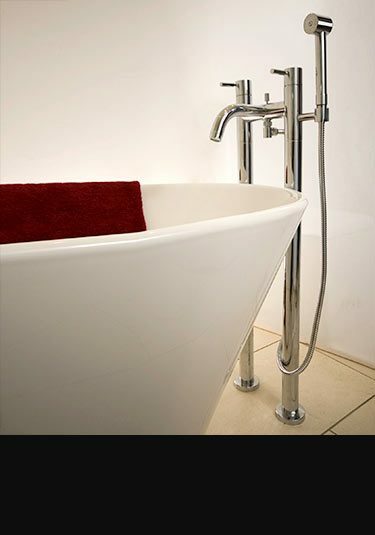 Floor standing bath tap in brushed stainless steel with a choice of 8 colour finishes for the tap handles. This freestanding tap has a shower attachment which is ideal for hair washing and bath cleaning. Made of luxury stainless steel with a brushed finish, this floor standing tap is operated via a single lever mixer. Each freestanding tap includes a handheld shower head with an easy clean spray head. This shower attachment is ideal for easy hair washing and maintenance cleaning. 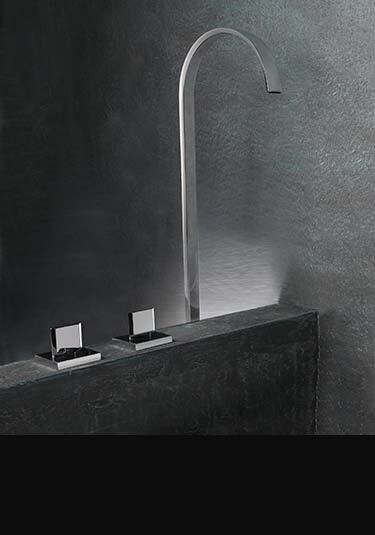 A European designed bath tap that is a good contemporary choice for design led bathrooms. A beautiful flat water spout which is designed to be used as a wash basin filler or a bath filler. Each spout would require a mixer tap to operate and is not included in the price. This freestanding waterfall bath tap has a large cascading spout for tranquil bath filling. Each waterfall bath filler includes a contemporary shower attachment with a smooth hose. 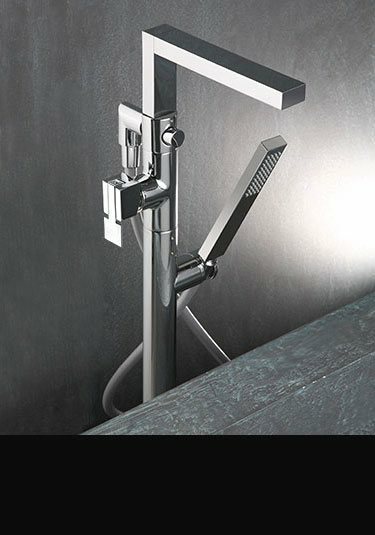 The bath tap with shower attachment is operated using a single lever mixer tap with a divertor switching between the 2 functions. 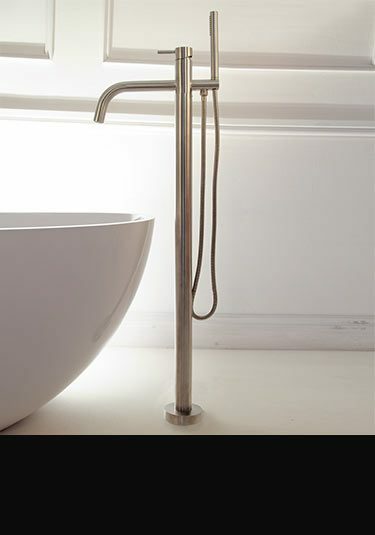 An Italian designed freestanding bath tap made of solid brass with a smooth chrome finish. A contemporary bathroom choice, this filler has separate hot and cold taps allowing faster bath filling. Made in the EEC. 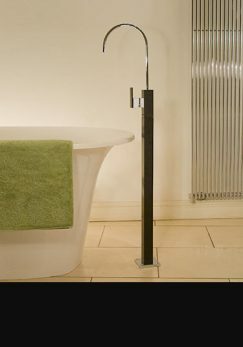 A floor standing bath filler with a single lever mixer valve. This easy to operated freestanding tap has a lovely long water spout and is stylish choice for a well specified bathroom design. Designed and manufactured in Europe. 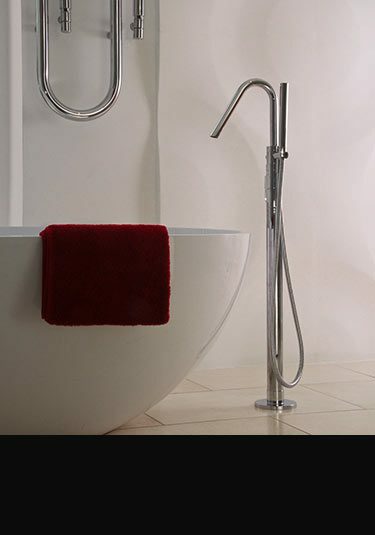 A luxury quality bath filling spout that is floorstanding. 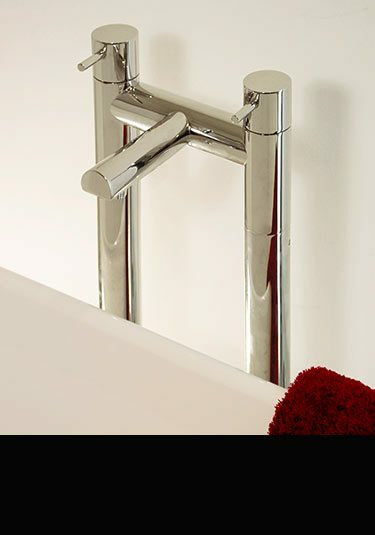 Made of solid brass this a smooth chrome plated finish this freestanding bath filler is operated via a separated tap valve. European designed and made. 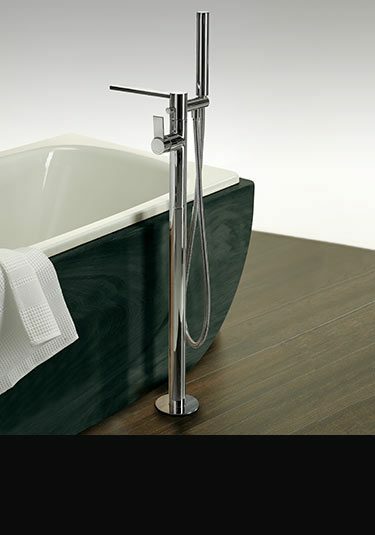 Freestanding bath tap is the latest in Italian square styling. Designed to be floor mounted this impressive cubic bath filler has a handy handheld shower attachment & available in chrome & matt white & black. 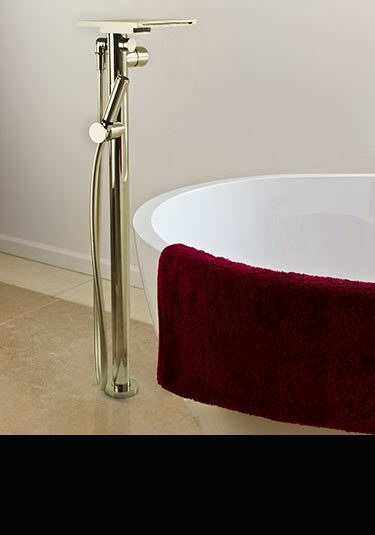 Beautiful European quality gold bath tap with a stylish waterfall spout. This freestanding bath filler has a thick gold plating onto solid brass and includes a handy shower attachment. A floor standing bath tap with an attached handheld shower. 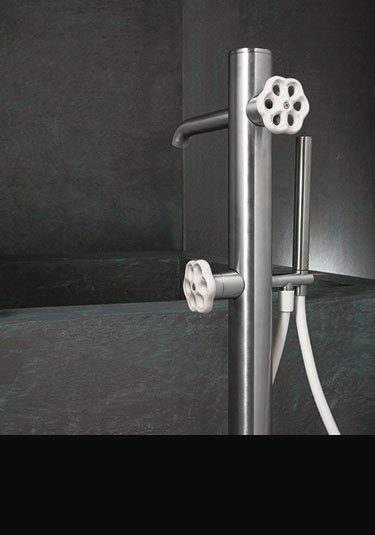 This freestanding filler is operated via a single lever mixer using the latest European cartridge technology and has a simple divertor to switch from the tap to the handy shower head. 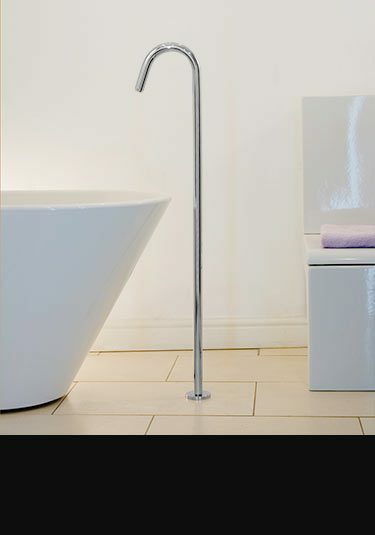 A floor standing bath filler with a shower attachment that has been designed and manufactured in Italy. This freestanding tap is made of solid brass with a thick chrome plated finish. A luxury bath filler that is floor standing and with an exclusive design feature. This freestanding bath tap is unique for its pull out shower head which can be easily used for hair washing and maintenance cleaning. This nickel freestanding bath tap has a large cascading waterfall spout for tranquil bath filling. Each waterfall bath filler includes a handy handheld shower attachment. Beautiful European quality & Italian styling. 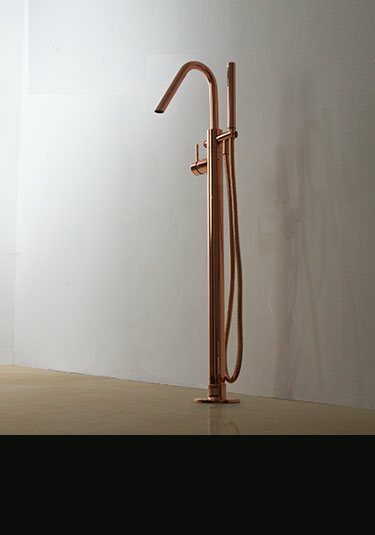 Impressive freestanding bath tap in a unique copper finish. This floor standing bath tap is part of a brand new copper taps collection and makes a beautiful design choice for luxury and exclusive bathrooms. A freestanding bath filler with a shower attachment that is uniquely controlled via a thermostatic cartridge. Ideal for floorstanding installation next to a stand alone bath, this Italian bath mixer tap is an exclusive addition to luxury bathrooms. A black floor standing bath filler with a contrasting chrome finish, all producing a stylish freestanding tap. This tall tap is European manufactured and designed with a high quality water mixing cartridge which ensures high quality operation. A nickel bath tap in a contemporary floor standing design. This freestanding filler is high quality European manufactured and is stood on two rigid legs housing the separate hot and cold pipes. Also available in a gold finish to special order. 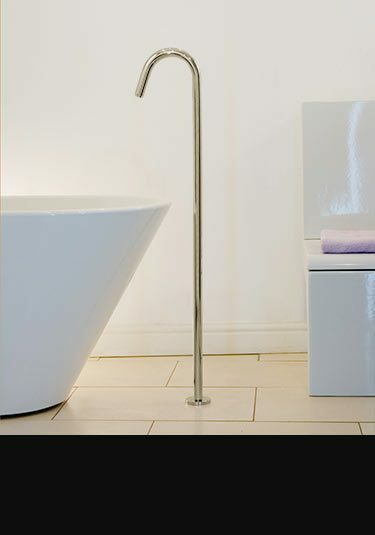 A nickel plated floor standing bath filler with a handy shower attachment is European designed & manufactured. Each freestanding bath tap has separate hot and cold taps which can easily be diverted to the handheld shower. A gold finish is also available to special order. 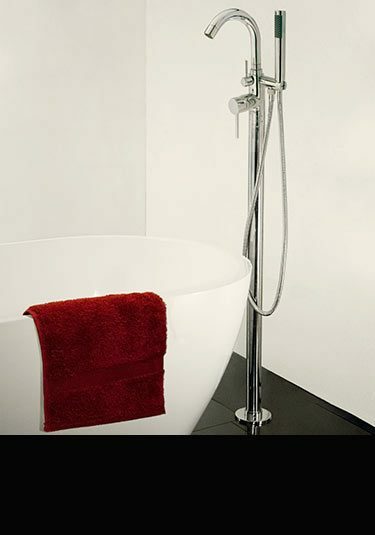 This contemporary freestanding bath spout is supplied in a warm nickel plated finish. A designer floor standing bath filling spout that is operated via a separate bath mixing valve. Also available in a gold finish to special order. A freestanding nickel bath filler in a polished finish. 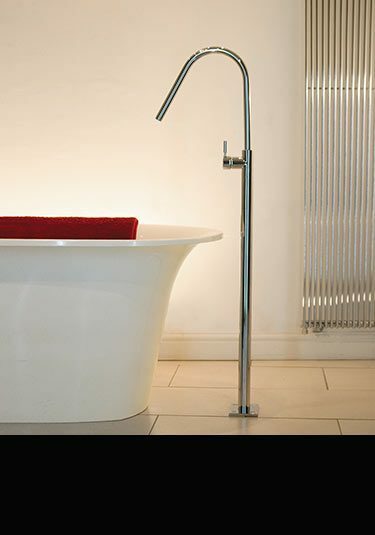 Mounted on a single floor standing leg, this monobloc bath tap allows easy and efficient hot & cold water mixing. 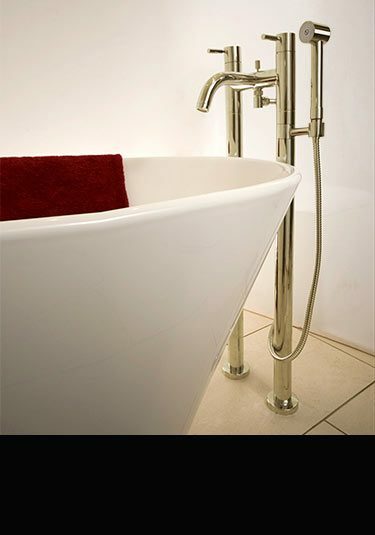 This designer floor tap is also available in a gold finish to special order. A lovely quality floor standing bath filler with a handy shower attachment. This freestanding nickel bath tap has single lever water mixing and is a lovely alternative to chrome in high quality bathroom design. Also available in gold finish to special order.